Close to the buzzing village and a short stroll to the turquoise waters of Little Oneroa Beach, Aroha Cottage is a lovingly renovated, character cottage ideally situated for you to enjoy the delights of island living. The cottage has a well-equipped kitchen and separate lounge/dining area with French doors opening onto a large deck. The choice of sunny areas and sheltered spots make this home entertaining and as relaxing as possible. Aroha Cottage sleeps up to 6 people in comfort. There are 2 sunny bedrooms; one furnished with a top quality super king bed, the second with 2 king single beds. Adjoining the kitchen and dining/day room there is a separate informal lounge area, which is furnished with a queen sized Futon sofa settee - chosen for the speed and ease with which it can be transformed from a casual settee to a comfortable bed. A separate, small studio with bunks, a shower and toilet completes the sleeping arrangement. A stylish cottage with a huge lawn, a short walk from Oneroa Village & Little Oneroa beach. A great family holiday home with the beach so close, along with a great playground! An easy walk to Little Oneroa Beach! House and Location was great, heat pump needed a restart to get working and Andrea was very helpful with that. Sorry that you had issues with the heatpump, but pleased the property manager was able to rectify it! We have updated the instructions to make it clearer to use. Please do come back again soon! Great place to stay with an amazing interior. Great place to stay with an amazing interior. Nice and handy to the Oneroa shops and worked well for us. The outhouse needed better ventilation and mosquitoes were an issue there. The outhouse needed better ventilation and mosquitoes were an issue there. BBQ had no gas so we had to quit that idea and put in oven instead which was disappointing. I am sorry that you had issues Marian and I wish you had called the property manager while you were in the house. The BBQ gas was not empty it was still half full when you left, we could have come round to see what the problem was had we known. We will make a suggestion to the owner about the ventilation, there are mozzie plugins in the room, I hope you used those. Please do come back! 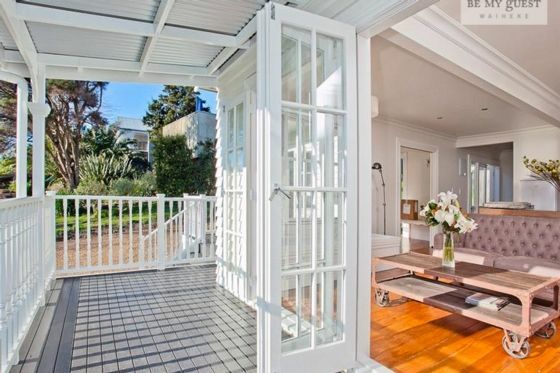 This gorgeous property is located in Oneroa, the main township on Waiheke Island. It is in a laid back residential area, with fabulous cafes & shops on your doorstep, and the beach down the hill.